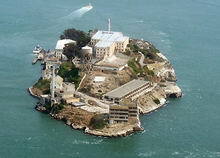 Get the information about Alcatraz Island in California, USA. Read about its location and main attractions. Once it was a military fortress that protected San Francisco Bay since California's Gold Rush days. In 1934 the site became a federal prison, mainly to punish criminal excesses spawned by Prohibition and the Great Depression. Alcatraz was planned as a concentration-style prison to accommodate tough customers transferred from other federal brigs. "The Rock" became escape-proof due to the bay's icy water and strong currents, although five prisoners are officially listed as "missing and presumed drowned". Al Capone was among the first arrivals, after doing hard time for income tax evasion. Other notorious prisoners who occupied its 336 one-man cells were kidnapper George "Machine Gun" Kelly, the FBI's first Public Enemy Number One Alvin Karpis, and Robert Stroud, the "Birdman of Alcatraz" who really conducted his bird studies while he was still in Leavenworth. Alcatraz was closed in 1963, primarily because of excessive costs, and American Indians took over what they considered their ancestral territory on several occasions, as well as a 19-month occupation that ended in June 1971. About a million visitors annually climb the steep hill from the ferry dock to observe the cells in crumbling cell blocks, guards' living quarters, and a bird sanctuary, but there is no gas chamber as that work was performed at nearby San Quentin.